Professional locksmiths deal with all manner of security. Beyond offering you information on the best locks for your front door, there is some insight that can be offered about other security devices. Not necessarily what to buy, or where to buy, but rather how to make the best choice between products. In the case of buying a home safe, here are some things to keep in mind. One thing that you can notice immediately before buying your home safe is the name on the door. Brand names don’t mean everything, and some brands can vary significantly in quality between models, but they do play a role in what you can know right off the bat about the home safe. The easiest brands to know to avoid are the brands the security experts know to be low-quality. Mainly, you find these brands as the top results for home safes on Amazon or at big box stores such as Walmart. They are widely available because they are cheap to make, and therefore cheap to buy. But they are cheap because they cut corners in the manufacturing process. You might not need a home safe from one of the best safe companies, but chances are you do want something that provides security and protection. The small light safes made by companies not known for security do little more than a locked filing cabinet. Make sure you are not spending your money for just a brand name, but also investigate the standing of the companies you look to buy your home safe from. Another thing you can tell just by looking at a safe is the distance between the door of the home safe and the safe’s body. That visible gap allows a point of leverage that can be used to pry the door open. This opening can also be used to attack the bolts that are used to secure the door. Among the many things people don’t know about safes, it is not generally known that some of the most common methods criminals use to open safes are made much easier by a wider gap between the door and body of the home safe. The tighter that connection is, the less space you will be giving thieves to work effectively. Another gap you need to concern yourself with are any holes that have been pre-machined into the body of the safe. These are often mounting holes that are intended to be filled will bolts so that the safe cannot be moved. If these openings are left unfilled, then the safe is more vulnerable to moisture, heat, burglary, etc. How the home safe has been welded together is not always easy to determine with a glance as things like gaps and brand, but you can use your sense to find the information you need. What you are looking for is the difference between spot welding and a continuous weld. A spot weld looks like a circular dimple. These dimples can vary in size and vary in the distance between one another. Compare this to a continuous weld, which melds two pieces of metal along the entire boundary of their overlap. You do not want a spot weld because this method of construction is easy for criminals to undo. Spot welding is cheaper because it can be done faster, and time is money. Time also means security, and the better your safe walls are bonded together, the more secure your safe is. Know what you are paying for, and don’t spend good money if all you are getting is a spot welded home safe. Just by looking at a safe you can see how they can be opened. Even with a key override, there is likely going to be a way to insert a combination that will open the say. 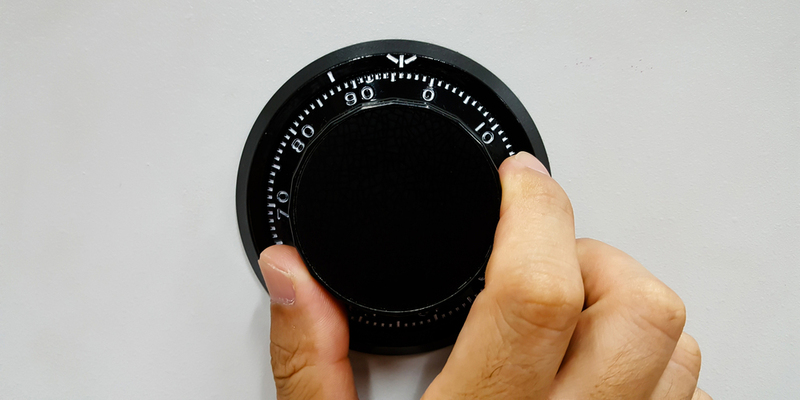 There is no universal recommendation for the type of dial that every individual should have for their home safe. There are pros and cons to each. Takes less time to insert the combination. Simpler to change the combination. Can be damaged by water, electromagnetic pulse, etc. Unlikely to break down over time. Can be decoded by a professional safe locksmith. Takes more time to input the combination. Some learning required for use. Difficult to change the combination. When you forgot the combination to your safe, having a manual dial means there will always be the option for a nondestructive (or not entirely destructive) method of entry. That option might come with a hefty price tag, depending on the available home safe techs in your area. But there will always be the chance of using manipulation to get around a safe lockout. This is not always the case when talking about the electronic locks used with something like a digital dial. Unless there is a way to override the current combination (or some type of safe specific bypass), there will be a need for destructive entry. And if there is no way to get an emergency current to the dial after battery failure, the safe will be extremely difficult to open. Many safes, old and new, have keys that can be used in lieu of the safe’s combination. This creates many issues. The first is that key control becomes an issue. A key can be stolen or lost, where a combination cannot so easily be stumbled upon or taken by a third party. The introduction of a keyway also creates the concern of having yet another way to open the safe. The home safe becomes vulnerable to lock picking and lock cylinder bypasses, and therefore vulnerable to another class of thieves. The positive of having a key override is that you can use a key if you ever forget your combination. Using a key is not going to necessarily be faster than inputting the combination, especially in the case of a home safe, as you are unlikely to carry around a key within the confines of your own home. You have to decide how your safe will be delivered and installed. Most often people chose the less expensive option of curbside delivery for their home safe. Besides the price difference, it also allows for greater discretion in terms of placement of the safe. But no matter what you chose there are two factors you need to deal with for installation prep. Size – How large your safe includes the proportions length, width, and height, but also the weight. The size influences how large of openings you will need to move the home safe throughout the house. The final resting place of the safe needs to do more than fit the safe’s dimensions. The path to the final installation point must accommodate the safe’s dimensions as well. Moving – The average home fire burns at a temperature of 1,100°F, but what is most important is that you have the right tools and manpower. Besides being able to move the safe, when the safe is moved into your home or onto your curb, the delivery company’s discretion is very important. You do not want your safe movers advertising “SAFE MOVER’S HOME SAFE DELIVERY” so that everyone knows you just got a new safe. With those main points in mind, installation should go rather smoothly. Getting a large safe upstairs or into a bedroom or other cramped rooms are going to be more difficult than putting it in a garage, but nothing is impossible if you have the proper home safe installation path. Before you buy your home safe you need to know how much space you need for storage. Depending on what you are putting inside, a lot of space may be taken up rather quickly. A good example of things that take up space rather quickly and more than people anticipate are guns. Most people find that home safes they have purchased for firearm storage, advertised with racks to fit ‘X’ amount of rifles, pistols, etc., rarely come close to being able to safely/effectively house that number. This example is meant to illustrate that you need to know what is actually going to fit in your safe. Knowing what you are going to store, and how much space that is going to take up is important because you should always buy a safe bigger than you think you need. There are many things that people forget to secure, but many home safe owners try to fit these things in after their safe is full up with what they had anticipated storing. The end result is an over-packed safe or not everything that needs security getting properly stored. Ratings – Whether it is a burglary rating or a fire rating, you are looking for duration and vulnerability of exposure metrics. A good illustration of this is a safe that is fire rated to withstand 350°F for ninety minutes versus a safe that is rated to withstand thirty minutes at 1,200°F. This is important because there are two variables that change and duration may seem more important than temperature or vice versa. These numbers get jumbled around and the tests are constructed to favorably represent the products. But it is important to know that the average home fire burns at a temperature of 1,100°F. Now the duration of ninety minutes at 350°F does not look as impressive. But these same factors apply to burglary rated safes that give a time it takes to force entry as well as a resistance level based on pressure and torque the home safe can withstand. Metal Thickness – When it comes to the metal content of a home safe we are talking about gauges of steel. Steel gauges countdown toward greater thickness, meaning that 7 gauge steel is thicker than 32 gauge steel. After the gauge numbers metal is simply measured in inch fractions 3/16” all the way into multiple inches (often capping out at 2 inches in thickness). Anything above 12 gauge is better classified as a lockbox rather than a home safe. One of the most important things about the metal thickness of a home safe is where it applies. Often a door is going to have a greater thickness than the safe body. This means it will be easier to cut the body of the safe than to cut the door. In fire-resistant home safe may appear to thicker walls or doors because of insulation. There is no such thing as the perfect safe. There is no safe that is perfect for everyone. With these insights hopefully, you can get the safe that is right for you without making any large-scale blunders. As long as you keep all of these things in mind you should be able to get a quality safe the fulfills the criteria you need a home safe. Best of luck getting your very own home safe.